Local teen and aspiring journalist, Trevor D'Arcy, spent race day roaming the criterium and arts festival. He was accompanied by fellow teen and aspiring action sports photographer, Thomas Nees. 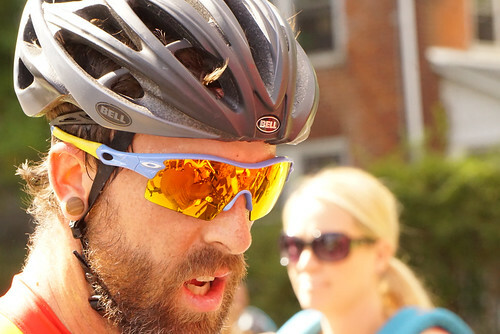 The Thompson Bucks County Classic bike race was the grand finale that wrapped up one of the biggest weekends of the year in Doylestown. 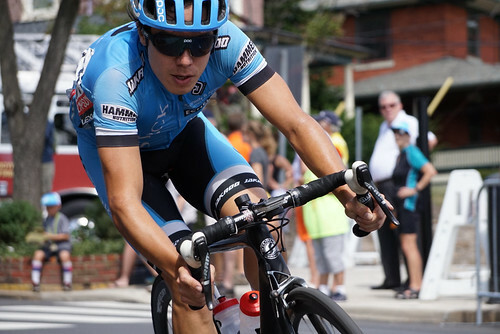 Founded in 2003, the Classic brings in some of the biggest names in Pro Cycling to tear it up on the iconic streets of Doylestown, Pennsylvania. This being my first time attending the event, I had no idea what to expect. An avid fan of the Tour de France, I hoped to experience the exhilarating thrill of professional cycling, but quickly realized this event was more than just a bike race. The race was an opportunity for local businesses to advertise their products through sponsorships. Without the help of the Doylestown business community and local volunteers this successful day would not have been possible. I realize now this really is the biggest day of the year for my home town. 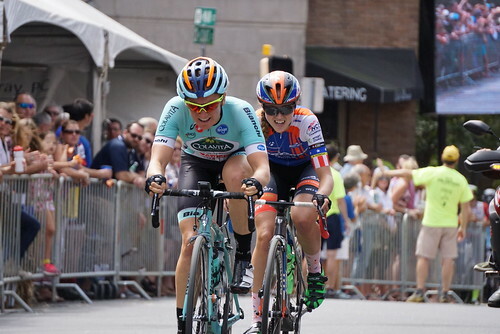 The race schedule featured a wide variety of events ranging from the children’s fun race to the Thompson Pro Criterium to finish off the day. 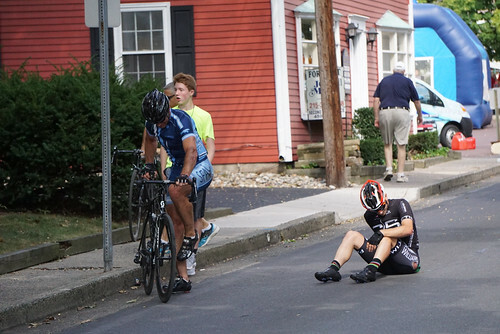 The amateur men began the day of racing on the Doylestown Criterium course. These up and coming stars were given the opportunity to showcase their skills on the famed course the pros would ride later in the day. During the amateur race I took the time to familiarize myself with the circuit. While exploring the course I came across a race volunteer. Chuck, a resident of Doylestown, had been volunteering at the bike race for ten years. Asked why he annually volunteers for the race Chuck responded, “I live here, I ride here.” The location of the race brings Chuck back year after year to witness pro riders racing on his home streets. Chuck also told me it was important the race was “sanctioned by USA Cycling” because the high profile organization attracts some of the world’s best cyclists, such as Lupus rider Chris Horner. The children’s races began at the conclusion of the amateur race. The family friendly atmosphere brought smiles to the kids as they pedaled hard hoping to win a medal. A wide range of emotions were expressed throughout the children’s race. On one side of the picture there were the competitive riders, the kind of kids that wanted to win at all costs and treated the race with intense concentration. Of course there were also the calm and relaxed riders, who were enjoying their moment in the spotlight. It was comical to witness both ends of the spectrum. Following the race I talked to the mother of a son who raced in the 6-8 year old division. She said, “I love the kid’s race more than I like the bigger races.” The kids put on a show that matched that of the pro racers simply through their youthful innocence and raw emotions. The announcer of the event put it best when he described the race, “Never disappoints here in Doylestown, so many kids racing”. The children were given an opportunity to show off their talents to the community and it was exciting watching so many compete. The grins of the children receiving medals from the Thompson volunteers summed up the success of the day. New to the racing schedule this year was the Lenape Scorcher. The race was unlike anything I had ever witnessed in my life. High wheeled bikes called penny-farthings were ridden up and down the finishing straight away. These bikes were popular in the 1800’s and looked like they required extensive training just to stay on. I’ve seen these old fashioned bikes in pictures but never saw anyone ride them competitively. The Scorcher exemplified how diverse the event was. There was something for everyone, even the history buffs. The Doylestown community was able to witness kids on tricycles, men on high wheelers, and professional cyclists all in a day of fantastic racing. Perfect weather allowed for fabulous crowds that grew as the day progressed. All of the day’s events culminated in the finale of both the men’s and women’s pro races. Sponsored by Doylestown Health, the women were competing for a twelve thousand dollar prize equaling that of the men’s race. Twenty women started the race, including seventeen year old local, Paige Shumskas, who attends Central Bucks East High School. They reached incredible speeds on the downhill stretches of the course. 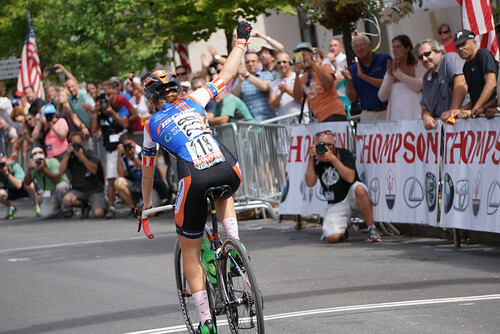 A fan commented on the speed of the professional women, “The ladies are as fast as the amateur men.” Skylar Schneider attacked on the last few laps insuring her victory in the Doylestown Health Women’s Pro Race. The pro men's race cranked the day up one more notch. These highly trained pros took daring angles and hit corners in perfect rhythm. The 100 kilometer race lasted over two hours making it one of the longest Criterium’s in the world. During the race I had the opportunity to speak with Eric Lepping, a bike mechanic who worked with numerous pro teams beginning in 1988. I asked Mr. Lepping how he dealt with high pressure situations while repairing a broken bike during a race. He said, “it’s a rhythm you get into after years of doing it, having your things in place, there’s life skills to be learned.” Here is a man who has related his love for cycling to encountering and dealing with real world problems. Mr. Lepping described how he made “lifelong friendships” through cycling and how the sport has become a part of his life. It is inspiring to meet people who successfully used sports and entertainment to shape their lives. The pro racing teams also influenced some families and cycling enthusiasts prior to the race. Many cyclists and their teams bunked with local families living in Doylestown the night before the race. Mickey Price, a fifteen year old student at CB West, told me his family housed some of the cyclists and managers from the Professional Team Lupus. I asked him what it was like to see professional cyclists sitting in his living room. He told me, “it was interesting to experience the different cultures and backgrounds of the riders and cool because I was able to see them interacting with each other off their bikes.” To witness professional riders in a bike race is exceptional, but to have them stay over in your house is a once in a lifetime opportunity. The sponsors, volunteers, race officials, and crowds combined to create a tremendous day of racing and a successful finish to a busy weekend in Doylestown. Witnessing the Bucks County Classic gave me perspective on the Doylestown community as a whole. I am fortunate to live in a place where people come together as one to plan and produce such an exciting event for the town. I will surely be back next year and encourage other teens to come out and support such a tremendous day for the town of Doylestown.